While the level of expectation on the Edmonton Oilers was nowhere as high as what the Winnipeg Jets faced heading into the 2015-16 NHL campaign, both clubs seasons can be viewed as nothing other than utter disappointments. So it would only seem natural to come to the conclusion that the two organizations will be looking to making changes to their rosters heading into the 2016 Entry Draft. With that being the case, would it really be so far-fetched to see Peter Chiarelli and Kevin Cheveldayoff make a blockbuster deal revolving around the Oilers first-round pick and defenceman Jacob Trouba? On the surface, it would seem rather absurd for the Jets to even consider moving the 22-year old rearguard in any kind of trade. Once you take into consideration the American blueliner is only getting better with each and every game he plays, the future looks rather bright for the No. 9 selection in the 2012 Draft. Problem being, if his rumoured salary demands of $6-$7 million per season on an eight-year pact are anywhere close to accurate, Cheveldayoff may have his hand forced into moving the pending restricted free agent. Having said that, the most important part of what you just read were the words “may have his hand forced”. While the player may want to sign a lengthy multi-year extension at “x” dollar value, the team holds all the cards in said situation. On more than a few occasions, such a scenario has led to the two sides agreeing on at least one, if not a couple, of bridge deals before figuring out things on a long-term contract. 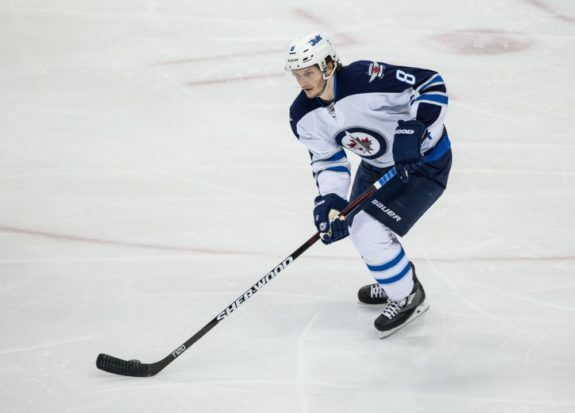 However, that mindset has started to change in recent years and that could end up playing a big part in what direction Trouba and the Jets ultimately decide to go. Teams have to at least inquire about Trouba now. In Winnipeg’s defence, the supposed ask does appear to be a little rich for a guy with roughly 200 games under his belt and nothing resembling gaudy offensive totals. Be it right or wrong, the defencemen who tend to get big money prior to reaching unrestricted free agency put up offensive numbers and Trouba has yet to do that. With that said, you can bet the Rochester native will be seeing a rather healthy increase on his current base salary of $833,000 in 2016-17…no matter where he ends playing. The wild card in all of this remains the availability and desire of New York Islanders blueliner Travis Hamonic to play in an NHL city as close as he can possibly get to his family in Manitoba. With the trio of Dustin Byfuglien, Tobias Enstrom and Tyler Myers already signed to multi-year deals and the Jets not exactly having the deepest of pockets when it comes to payroll, adding another defenceman with a cap hit in the neighbourhood of $5 million could be a little rich for their liking. Whereas the hometown kid, who continues to patiently wait for Garth Snow to find him a new home, would bring a cap hit of just $3.75 million with him in each of the next four seasons but there is one catch. Hamonic will actually be paid $4.875 million in each of those years, which would make the money almost a wash. Again, it seems like a bit of an odd move but with the Jets currently sitting in a tie with the Calgary Flames for 28th in the overall standings and the Oilers comfortably positioned in 29th, the thought of adding a pair of top five picks at this summer’s draft could be something Cheveldayoff seriously considers. Obviously, from an Oilers standpoint, the organization would not move the pick if it were to turn out to be a top three selection but that would likely change if they slot somewhere else in the final pecking order. If Winnipeg were able to grab Hamonic out of New York without parting with their own first rounder and then flip Trouba to Edmonton, the Jets would potentially be adding two major pieces to their organization for the future, while still maintaining a solid lineup for the upcoming season. Like it or not, it would be something worth visiting. On the flipside of the equation, one can make the argument that Hamonic would probably be the better fit for Edmonton’s backend in 2016-17 but Trouba has the much higher ceiling and has already been logging major minutes in Winnipeg during each of his three seasons. While the Jets use him in all situations, his time on the power play would increase greatly in Edmonton, where his heavy point shot would be a welcome addition…not to mention his handedness and ability to move the puck up ice. Again, something worth visiting. At the end of the day, there are more than a few scenarios that would need to fall into place for the Edmonton Oilers and Winnipeg Jets to seriously consider making such a swap but weirder things have happened. It would not be a move without risk but one that could be well worth taking for both organizations and possibly pave the way for what could prove to be rather promising futures. One thing is clear, the end of June can’t come soon enough.